Imagine a city where surveillance cameras are unified and available at any time to Public Safety responders. Expand this vision to include businesses and communities who need to participate in order to improve their response time during critical incidents. Realizing the vision begins with municipal leadership and the foundation is the network, more specifically a Peer-to-Peer IP Surveillance Architecture, patented by LEVERAGE Information Systems. keeps Public Safety and Communities safe. Protection of video evidence in any small or large-scaled Municipal Video Surveillance System is critical. DETECT®Incident Library captures and protects digital evidence and is a feature included with DETECT VMS. Municipal surveillance systems can be effective and efficient through the sharing of assets. The need for Incident Libraries within a Municipal Wide Surveillance system becomes apparent when considering security and confidentiality needs of individual departments. All departments benefit from shared resources such as network infrastructure, surveillance cameras, Network Video Recorders, and more. Designed for public safety, DETECT VMS’ proactive response capability allows intervention into nuisance and criminal activities. DETECT VMS is a force multiplier with a proven track record. A Municipal-Wide IP Surveillance System must be capable of sharing network resources, surveillance cameras, and network video recorders. 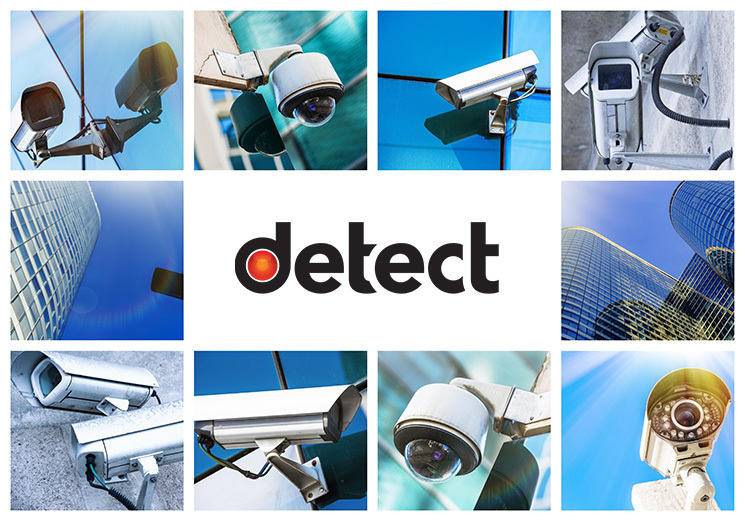 DETECT VMS’ peer-to-peer architecture allows any camera access by any viewing station. 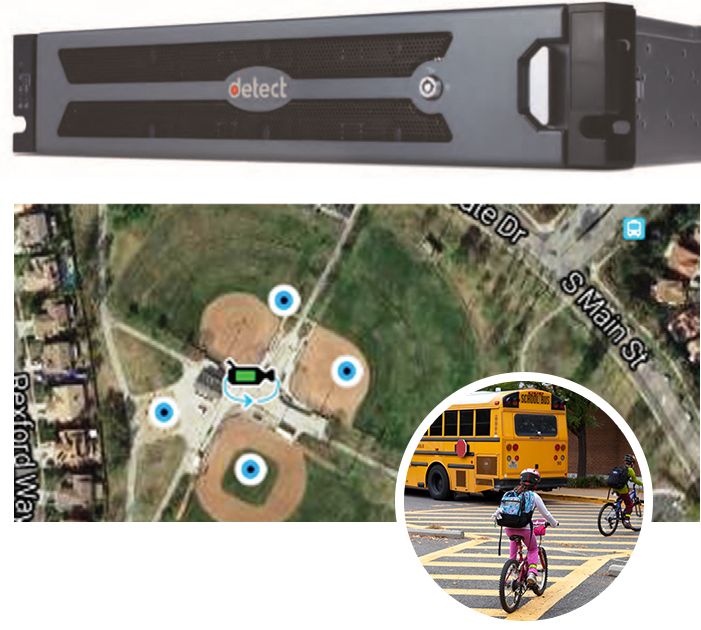 Mapping features with DETECT VMS geo-locate cameras while providing an easy-to-use interface. Selecting a camera for viewing is as simple as clicking a camera ICON. A real-time response capability is critical for a Municipal-Wide IP Surveillance System. At the core of DETECT VMS is a peer-to-peer IP Surveillance Network and video management software, providing first responders with situational awareness in real-time and the ability to improve decision-making during critical events. 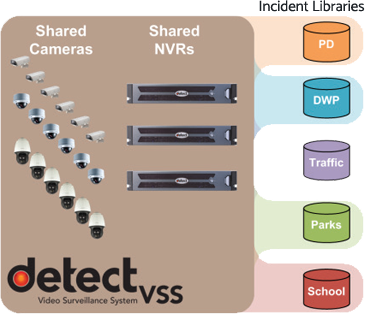 DETECT VMS, SSM, NVR and SMART are applications developed by the DETECT team at Leverage Information Systems (LEVERAGE) to deliver the high quality video and audio essential for municipal surveillance, enabling real-time situational awareness and real-time response. DETECT contributes to LEVERAGE’s support of Government leaders whom are digitizing their infrastructures and analyzing and optimizing data and services to drive job creation and growth, improve government efficiency, assure security and improve citizen experiences. © 2017 Copyright - Detect Surveillance. Design by G4 Design House.